My favorite album of last year came courtesy of Toronto country singer Lindi Ortega. Her debut Little Red Boots struck a cord, earning her not only my praise, but a Polaris long list spot. On October 2nd Ortega returns with her mature follow-up, Cigarettes & Truckstops. A razor sharp tongue is a hallmark of Ortega's songs. The chugging "The Day You Die" is a pumped up frolic. Full no-nonsense attitude is on display with the piss-off song "Don't Wanna Hear It". A playful clap and foot stomp bring a smile to your face during the rollicking honky tonk of "Demons Don't Get Me Down". The blues are in full effect on "Murder of Crows". Ortega's raspy voice giving the track a roadworn gritty feel. She tones it down on "Heaven Has No Vacancy", but the song is no less powerful. There's a serious side to Ortega too. The title track features a haunting echo on her voice, making it seem as though she's channeling the great Emmylou Harris. A bittersweet harmony makes "Lead Me On" a real heartbreaker. Cigarettes & Truckstops is a more measured and restrained album than Little Red Boots. It doesn't make it any less compelling. The freewheeling hooks of Ortega's debut have been replaced with a smoldering intensity that's just as delicious. Best tracks: "Demons Don't Get Me Down", "Lead Me On"
I saw her open for Social Distortion in Reno back in May. I have been looking forward to this album, Use Me is my favorite track by far. 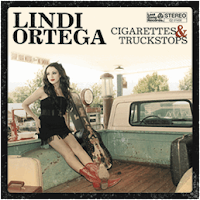 Country music stars of today need to take notice of Lindi Ortega.